Help the flying saucer to find 7 world wonders. Open two same cards with plastic soldiers. 40 pieces square rotating puzzle with a world wonder. 5x8 pieces puzzle with picture of the Colosseum of Rome. 40 sqares puzzle with picture of the Great Wall. 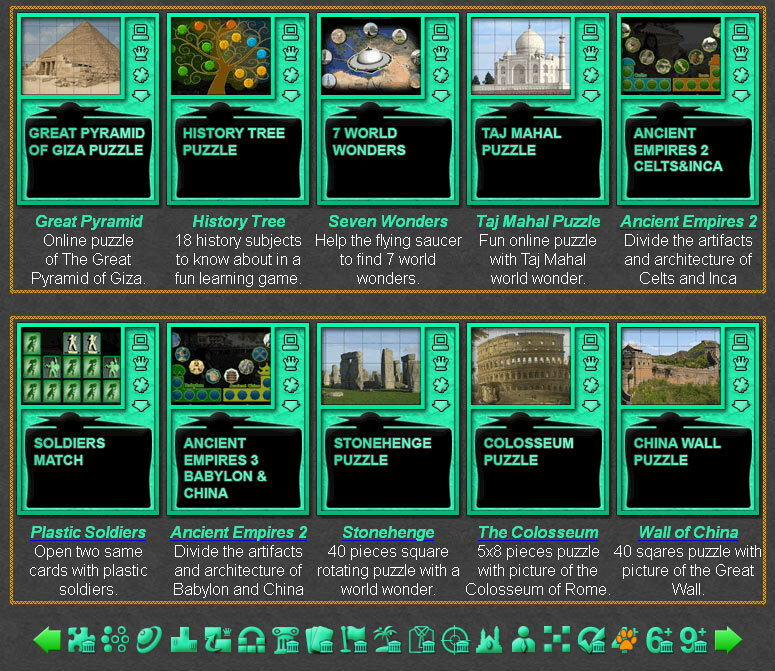 Fun online history games and puzzles for 4-5 grade collection. This category include all history games, suitable for kids 4 - 5 grade. Fun History Games Collection for Kids. History Tree Game - Arrange the tree with fruits of history sub-disciplines. Knight's Armour Parts - Equip the knight with a medieval armor ready for battle. Ages of History Game - Ascend through the pyramid of history eras. 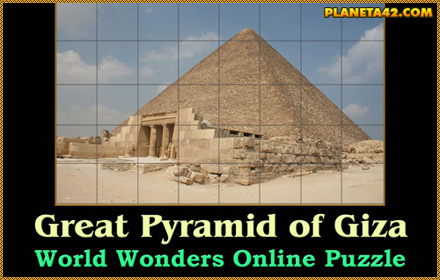 7 World Wonders Puzzle - Place the seven world wonder on their correct location. Soldiers Match - Open two same cards with plastic soldiers. Great Wall of China Puzzle - 40 squares puzzle with picture of the Great Wall. Colosseum of Rome Puzzle - 5x8 pieces puzzle with picture of the Colosseum. Stonehenge Puzzle - 40 pieces square rotating puzzle with the Stonehenge world wonder. Machu Picchu Puzzle - 5x8 pieces puzzle with Machu Picchu medieval world wonder. Mausoleum at Halicarnassus Puzzle - Fun square rotating puzzle with wonders of the world. Temple of Artemis - 40 pieces online puzzle with remainings of the Temple of Artemis. Porcelain Tower of Nanjing - 5x8 square puzzle with medieval wonder of the world.